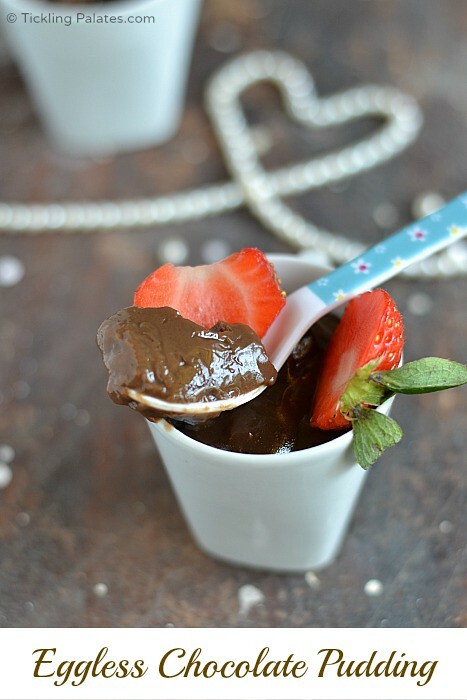 Eggless Chocolate Pudding is an easy to make, decadent & luscious dessert that takes just 4 ingredients & 5 mins of your time. 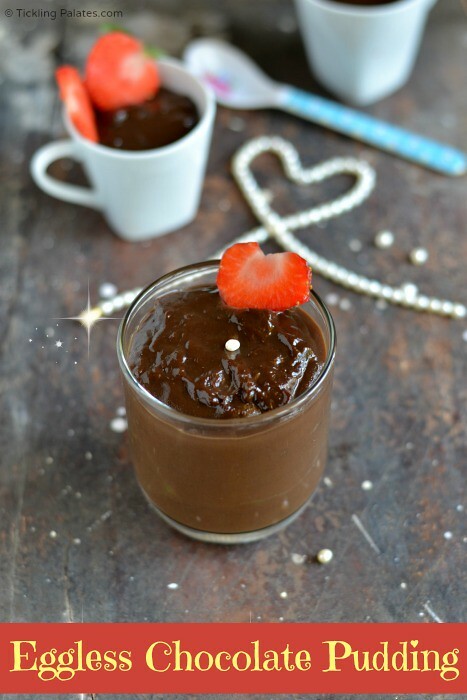 This quick pudding will satisfy your taste buds whenever you are hit with a sudden chocolate craving. But of course if you want it mighty chilled, you will have to wait for at least half an hour while this baby rests in the refrigerator. With no extra fat, this eggless chocolate pudding is a ridiculously easy to make ahead dessert that is bound to wow your guests. 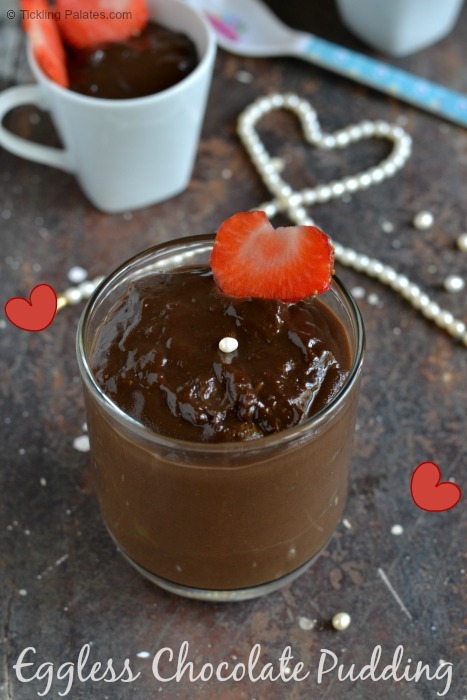 If you are really into big “Valentine Day” celebrations but don’t have enough time to pamper your better half by making an elaborate dessert, this chocolate pudding is bound to be your fall back recipe as it takes just 5-7 mins to cook up this yummy dessert. Honestly I personally feel that the Valentine Day is too much hyped up now-a-days. Everything looks way too commercialized, advertised & cheesy. Seriously do you really need a particular day to convey your love and affection and make the other person feel special. To me, love is a lifetime of work in progress that you can just never get any better as there will always be a moment in future that will be even more better and perfect provided you keep working at it. As my Mom’s neighbour is a Christian, every Sunday, lunch used to be a very big affair. She used to make this pudding in the morning and leave it in the fridge before heading out to Church and after lunch, this will be the dessert. Many a Sunday afternoons have been spent licking away this yummy, chocolaty dessert and I thought this will be just perfect for the occasion. You can also use the same quantity of corn flour (corn starch) instead of custard powder but make sure that you also add vanilla extract for flavor. Rinsing the bowls with water ensures that the pudding does not stick to the bowl. I used 2% milk, but you can also use full cream whole milk. Adjust the quantity of the sugar according to your taste. An easy to make, decadent & luscious dessert that takes just 4 ingredients & 5 mins of your time. In a small mixing bowl, take custard powder and cocoa powder together. Add 1/2 cup milk (room temperature) and using a balloon whisk, mix till they are completely dissolved in the milk without any lumps. In a saucepan, heat remaining milk, add sugar and using the whisk, mix till it dissolves completely. By now the milk will be steaming hot. Add the custard-cocoa milk mixture in a slow & steady stream to the boiling milk. Keep cooking over medium flame for 5 mins till the mixture thickens and the surface starts to look shiny & glossy. Rinse the bowls with water in which you are going to serve and pour the pudding into the bowls. After it cools down to room temperature, keep the bowls in the refrigerator for atleast an hour to get chilled. 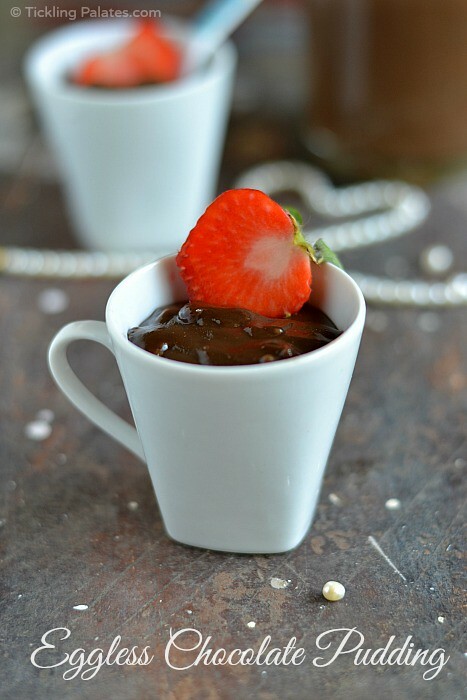 Serve this eggless chocolate pudding topped with any fresh fruit of your choice. While the milk is boiling, you can add a tbsp of butter for more richness. such a sweet and simple pudding recipe….i am gonna try this soon.. wonderful presentation..
wow… that looks very tempting!!! perfect for a easy breazy valentine’s dinner!!! 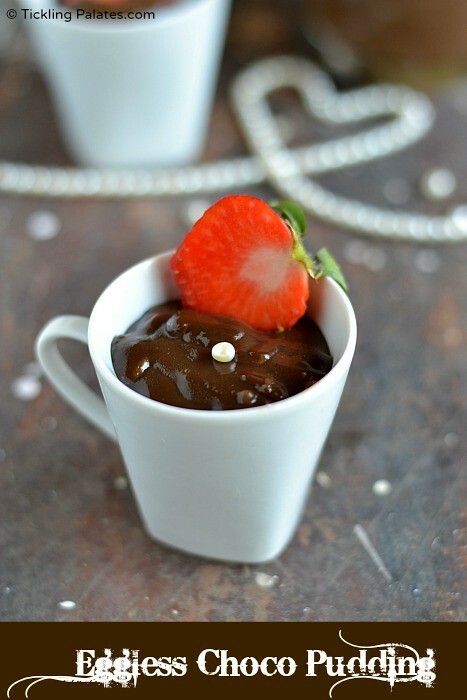 Radhika -You have a lovely blog and this delicious dessert is ‘easy-peasy’! Having said that I must CONGRATULATE YOU for having declared ‘the emperor is naked’! Your very honest wisdom statement regarding the ‘exaggerated and overblown’ celebration of Valentine’s day is so comforting to my heart and soul. You are much younger than me and I used to keep on wondering as to whether I was ‘undervaluing the overdoing’ of this ‘foreign’ Valentine’s Day celebration. Love needs no special day for celebration. Love is sacred and special everyday,every moment and every second! We do not need Mother’s Day,Father’s Day etc. in our land for at the core of our traditions it is MatriDevo Bhava,PitraDevo Bhava and AcharyaDevo Bhava! This is what we have to remind our children of! In our land we celebrate each day. We have to return home. Just casting an eye on the Hindu calendar one will see how our sages kept us on the spiritual trail! My real admiration for your courage to have uttered the unutterable! Lovely recipe for the day of love. Thanks for sharing.